Brief：Chinese President Xi Jinping met with his Greek counterpart Karolos Papoulias here on Sunday to exchange views on the development of bilateral ties and major international and regional issues of common concern. Chinese government encourages Chinese enterprises to invest in Greece, further improve management of major projects and make it a paradigm of mutually beneficial cooperation. Chinese President Xi Jinping met with his Greek counterpart Karolos Papoulias here on Sunday to exchange views on the development of bilateral ties and major international and regional issues of common concern. 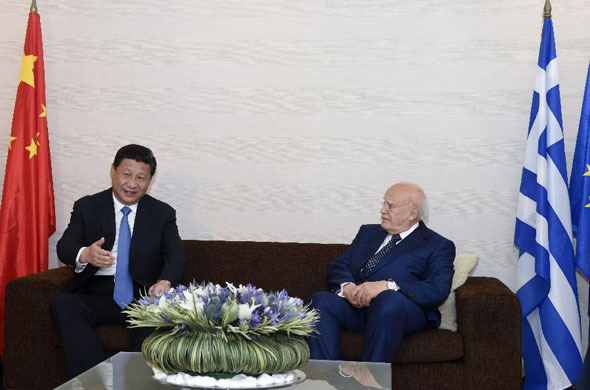 Recalling his meeting with Papoulias in February in the Russian resort city Sochi where they attended the opening ceremony of the 22nd Winter Olympic Games, Xi said they had reached a wide range of consensus and greatly pushed forward the development of bilateral ties. Chinese enterprises to invest in Greece, further improve management of major projects such as the Piraeus port, which is jointly operated by Chinese state-owned shipping giant COSCO and the Greek port authority, and make it a paradigm of mutually beneficial cooperation. The Chinese president also thanked Greece, birthplace of modern Olympic Games, for its continued support to China's sports cause, saying that China is willing to increase exchanges with Greece in this field and jointly promote the Olympic spirits. Papoulias, on his part, said Greece appreciates China's time-honored civilization, admires its achievements in modernization, and highly values its important role on the international arena. Xi's speech made during his recent visit to Europe has boosted Greece's confidence in China's future development and the broad prospect of Europe-China relations, he added. The Greek President said he strongly believes that to support China is to root for a multi-polarized world, and to uphold the force of peace and development, said Papoulias, adding that Greece stands ready to further strengthen friendly cooperation with China and actively participate in China's important initiatives of building a Silk Road Economic Belt and a 21st Century Maritime Silk Road. Greece will expand cooperation with China in maritime affairs and infrastructure building, among others, and it welcomes Chinese enterprises to invest in the country, said Papoulias. In the meantime, he called on the two countries to increase cultural cooperation and people-to-people exchanges. 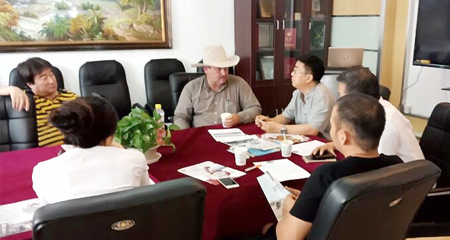 He wished the 2nd Summer Youth Olympic Games, which will be held in the Chinese city of Nanjing in August, a success. The Chinese and Greek presidents also agreed to further advance the development of China-Europe relations. Noting that peace is a common aspiration of people across the world, the two heads of state said the international community should keep alert of the attempts to deny or beautify the wartime aggressions launched by Fascists and make concerted efforts in safeguarding the results of the World War II so as to jointly promote world peace. Xi is currently making a stopover on the southeastern Greek island of Rhodes on his way to Latin America, where he is set to pay state visits to Brazil, Argentina, Venezuela and Cuba. In Brazil, he will also attend the sixth BRICS Summit and the China-Latin America and the Caribbean Summit.